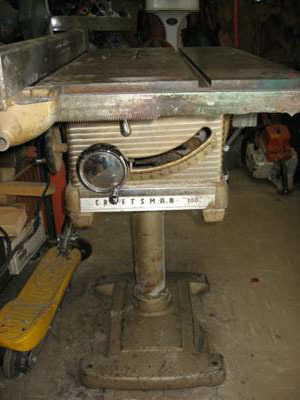 This is an old Craftsman Model 100 table saw. It is definitely not restored, but is in use as a table saw as well as a general work surface daily. I replaced the old motor with an updated 3 hp 110 v Dayton unit, and I installed a motor controller with heaters in case of an overload. Long live old well made tools !! !